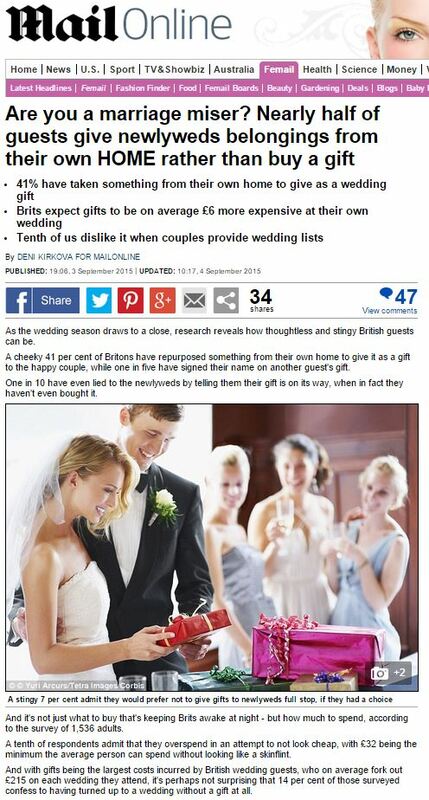 As the wedding season draws to a close, research reveals how thoughtless and stingy British guests can be. A cheeky 41 per cent of Britons have repurposed something from their own home to give it as a gift to the happy couple, while one in five have signed their name on another guest’s gift. One in 10 have even lied to the newlyweds by telling them their gift is on its way, when in fact they haven’t even bought it. And it’s not just what to buy that’s keeping Brits awake at night – but how much to spend, according to the survey of 1,536 adults. A tenth of respondents admit that they overspend in an attempt to not look cheap, with £32 being the minimum the average person can spend without looking like a skinflint. Aoife Davey, group marketing manager at One4all, the Post Office Gift Card, which commissioned the research, said: ‘It’s interesting to see the extent to which selecting and buying a gift can stress people out – and also quite alarming how many people have resorted to quite cheeky tactics when the panic has set in. This entry was posted in One4All and tagged Aoife Davey, daily mail, deni kirkova, One4All on September 22, 2015 by Michael Marshall.